Easy Pasta Fazool recipe. Learn to make Pasta Fagioli like an Italian. How to make Pavlova cake? Easy Berry Pavlova Recipe. Large Pavlova cake. Summer in coming to its end and I feel like I need it to last just a tiny bit longer. What better way to do it, than with food? One of my go-to instant summer foods is melon and prosciutto. Juicy and delicious with every single bite, just how I like it. Appetizers are definitely my favorite part of a meal. So many times I have found my self full, just from eating appetizers. Smoked salmon appetizers are super versatile and you can combine them with bread, crackers, rolled with cheese or placed on vegetables. I love to combine it with fresh cheese, but also with fresh herbs. Delicate taste and texture of smoked salmon always makes me think of simple dishes, light and without too many ingredients. Rolled frittata is healthy and easy to prepare dish. Rolled frittata is one of those recipes. You can eat it warm or cold, as a main meal served with salad or as a appetizer. You can fill the rolled frittata with many kind of ingredients, but in this basic kind I have used only ham and cheese as a classic filling. During the cold season I love warm meals with spoon and this rustic pumpkin soup with chickpeas and rosemary is a real discovery. What I love about is the final touch of roasted rosemary leaves in olive oil. The rich rosemary flavor just fills every mouthful longing for more. If you are looking for a heartwarming fall meal, then creamy pumpkin soup is at the top of fall treats. Creamy soup and crunchy hot dogs make a perfect combination and with each spoonful, there is a little feast in your mouth. I love the simplicity of the ingredients of this soup and how fast you can make it. One of my all year round, go to appetizers, are for sure baked mushrooms. I fill them with various ingredients depending on the season or the menu of the day. They are juicy and tender, filled with creamy soft cheese that fills your mouth with every bite. In Italy we eat a lot of salty cakes and combinations are limitless. Asparagus cake is one of my favorite. It’s combination of crunchy bacon and salty Parmesan cheese make it a perfect pair. As cooking in Italy is very seasonal (we can’t buy strawberries in winter) we have adapted the recipes and we eat whats fresh and in season. I have made this delicious cake in June and ate it with some fresh green salad on a side. If you are like me and you don’t skip a day without your afternoon snack, then cheese bruschetta is a perfect solution. What I love about it, is that you can make it with whatever ingredients you have at home. Today I will show you how to make a protein rich fresh cheese bruschetta’s. As fresh cottage cheese contains low carbs, but its high in protein and low in sodium it is perfect for people that are conscious about their weight and are looking for healthy quick meals. Adding few slices of fresh radishes and green olives will leave your taste buds satisfied and craving for more. With a touch of dill your cheese bruschetta will have irresistible taste. Since my first visits to Bergamo I recall going to a bar called La Vela per un aperitivo and soon it has become my favorite time of the day. Aperitivo time! In Italy aperitivo is usually served around lunch and dinner time and it is perceived as a snack before the meal or something you have while hanging out with friends. Abundance and the cost depends a lot on a place that serves it. I had aperitivo where we ate pasta, mini sandwiches, pastries in a buffet kind of a setting and those where I was served only potatoes chips and some nuts. Learn how to easily prepare traditional Italian dishes step by step! Do you want to learn how to make traditional Italian dishes? 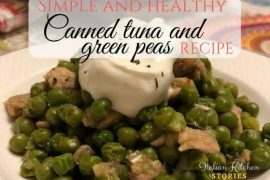 You can prepare this delicious healthy canned tuna and green peas dish in less than 30 min. Super easy beginner recipe on a low budget even students can afford.